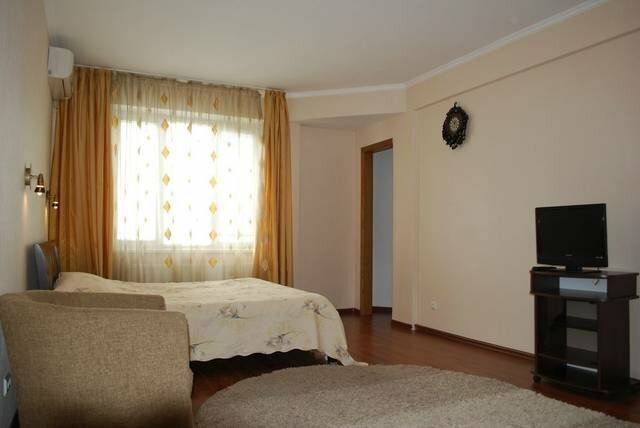 The apartment is situated in the city-center 2 minutes walk from Stefan cel Mare (the central street in Chisinau). Total area is 64 sq.m. with large kitchen, bedroom and dressing room. It is in a brand new building with autonomous heating system and hot water and with heated floors in winter and air-conditioning for summer. Everything required for a comfortable living is provided in the apartment: clean towels and linen, kettle, gas stove, washing machine, iron board and iron etc. We provide free airport pick-up if you rent it for 7 days and more.